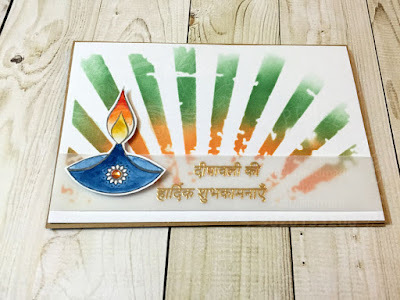 Paru's Perceptions: Diwali cards for our soldiers. Diwali cards for our soldiers. 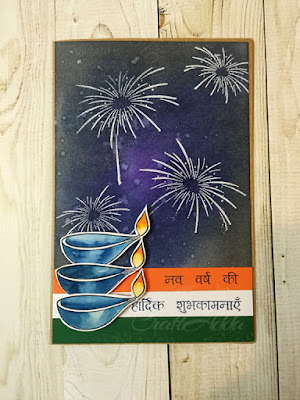 For my DT post for CraftAdda today, I am using the fabulous Diwali stamp sets from Craftangles. I was encouraged by my dear friend Neha Gala who is collecting cards to send to our brave soldiers who could not go home for Diwali. 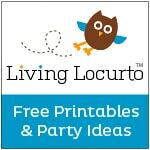 I was pushed out of my comfort zone, but, I am really thrilled with the cards I made. 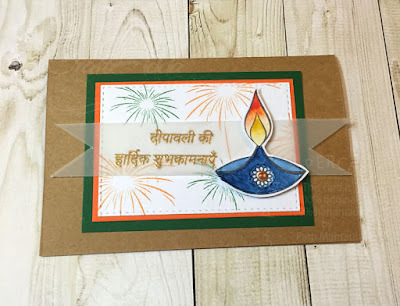 Happy Diwali stamp set from Craftangles. I heat embossed the background with Craftangles clear embossing powder. 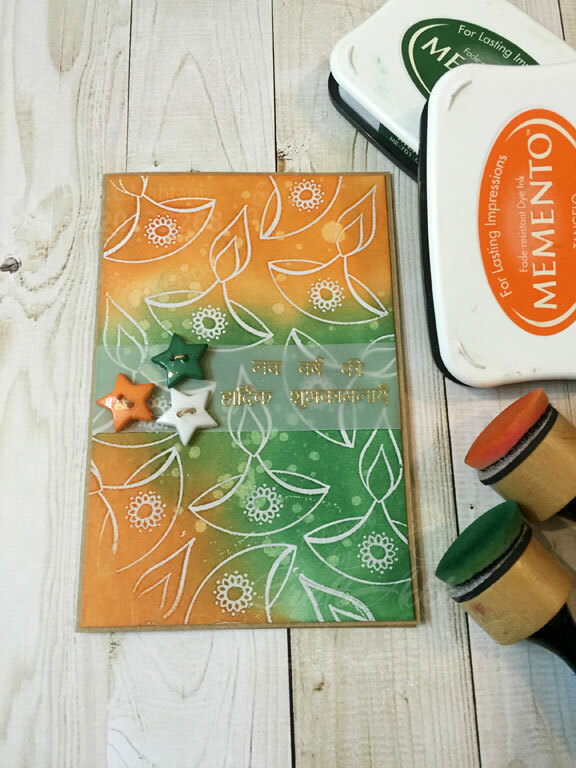 I then blended the background using Memento Cottage Ivy and Memento Tangelo inks. Once blended, I flicked some water onto the background and lifted off some colour. I then placed a scrap sheet of paper over the panel and ironed off the embossing powder. I then gold embossed the sentiment on a strip of vellum and attached it to the card panel. I used three star shaped buttons in the tricolours as an embellishment. I finished the card panel by placing it on a kraft card base. 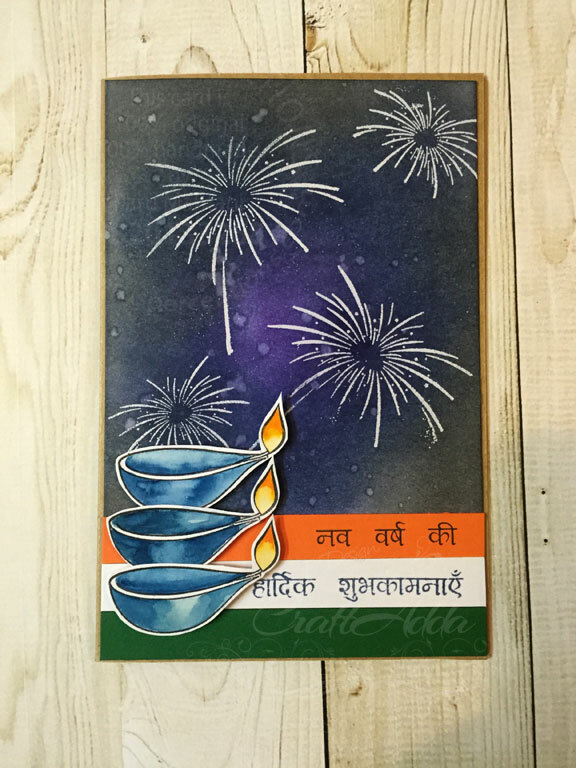 For this card, I started with stamping the fireworks stamp in the Indian tricolour on a piece of white cardstock cut with Simon Says Stamp's stitched rectangle die. I added a gold embossed sentiment on a vellum panel and added a watercolured diya. I finished the card by placing the card panel on a kraft card base. For this card, I started by using TimHoltz sun rays stencil and colouring in with Memento Cottage Ivy and Tangelo inks. I then added a gold embossed sentiment on vellum and a watercoloured diya. I then finished the card by placing the panel on a kraft card base. For this card, I created a dark sky background for the very first time!!!! I am so thrilled with the way this card turned out. I clear embossed the fireworks and then blended the background using memento and Tim Holtz inks. I then flicked some water onto the background. 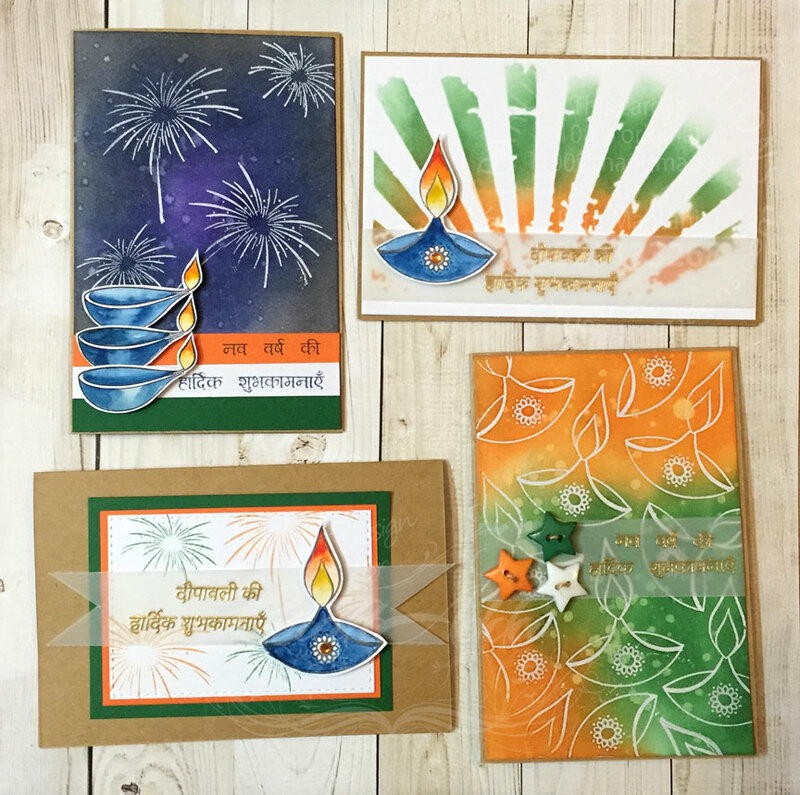 the Craftangles Happy Diwali stamp set. 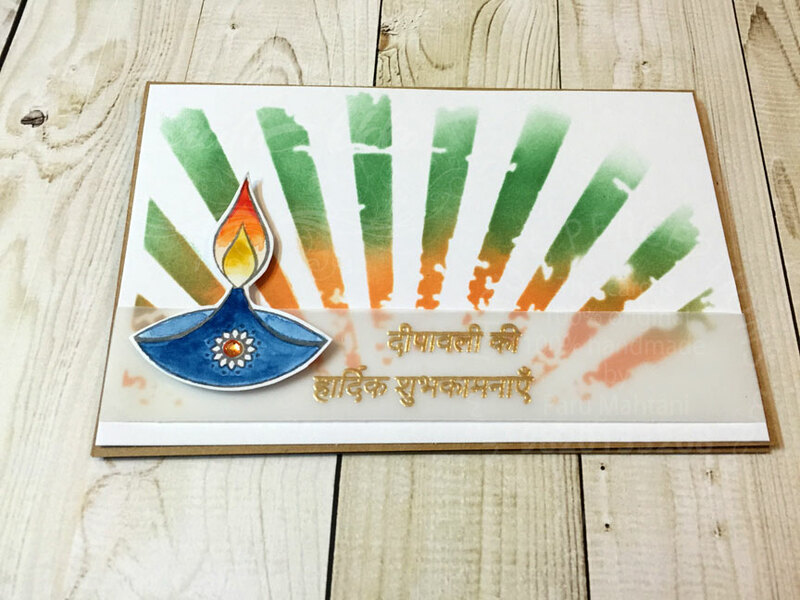 I added the tricolour panel at the bottom of the card to anchor the diyas and stamped the sentiment onto the panel. I hope you enjoyed this post and will be inspired to create a few diwali cards of your own.